Homeschool Physical Education is a topic that surfaces every so often on homeschooling lists. 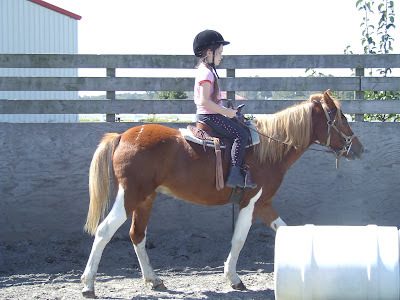 Somehow it always surprises me, the country mom whose day begins with feeding the horses and saddling the pony, but I realize that my life isn't typical. This is a real question and a real issue in today's world where obesity is rampant and opportunities for exercise must be sought out. Gone are the days when a kid got on his bike and took off for the day to explore woods and creeks, play ball with his friends and fish. So, in the world as it is today, how does a homeschool family organize physical activity? The real question is: Should you offer a course in Physical Education, as most schools do, or should you simply incorporate physical activity into your daily life? I think the answer is obvious. I will begin by mentioning recreational league sports. Most communities have organized sports teams for children from kindergarten to high school: soccer; baseball; football; cheerleading. Participating in these seasonal activities could serve as both exercise and playtime. They are also generally inexpensive and close to home. If you aren't a fan of organized sports why not try dance, roller skating, bowling or horseback riding lessons? Some of these options can be quite costly (riding, dance) and others (bowling, skating) are relatively inexpensive. Look in your telephone book and see what your community has to offer. Check at the library and community center. Churches also often have extra-curriculars, especially in small towns where there aren't a lot of options to keep kids, teens in particular, occupied, in shape and out of trouble. If you just can't afford to pay for your child to participate in anything with a price then you're just going to have to be creative. Try doing morning calisthenics, jog together, ride bikes or power walk. Play Mother-May-I or any of a hundred other movement games. If you have teens assign them tasks like mowing the grass or washing the car. Movement does not have to be conscripted to a physical education class. My friend, Melina, is a health coach and she believes that it's dangerous to relegate PE to specific time slots. Kids need access to physical activity all of the time and especially before serious lessons take place (author's note: especially for kinetic children!). 3x a week for 20 minutes is the way schools handle physical education but this does not set up a healthy approach to staying fit. It's a lifestyle, not a course. Both of my parents were body builders and opened a health food store in the early '60's. Dad was Mr. Virginia once and Mom held the Guinness World Record for Women's Squats (weight) for a while. Dad is still fit, Mom not so much. I grew up in a household where working out was just a natural part of daily life, like watching the news or taking a shower. It has stood me in good stead as I come into middle age and while I don't have access to a gym for working out, I do a lot of physical activity each day and eat well. I watch as many of my peers struggle daily with weight and more importantly with horrible body images which often are not realistic. I know from experience that incorporating physical activity into our lives can pay off big and am trying to pass this on to my own children. Like all things homeschooling, you have to put in some thought and work to find the proper approach for your family but try to think outside the 'Health and Physical Education' box. The best thing you can teach your child is to enjoy physical activity, whatever form it takes. That's truly what will set them up for a lifetime of fitness and confidence. Bettina Colonna Essert is a native of the Virginia/North Carolina borderland. She currently lives on a 'farmette' in rural NE NC with her husband, 2 home schooled children and a menagerie of farm animals. Bettina is an Equine Sports Massage Therapist. . Even if it involves a curriculum.. ha! We don't appreciate sleep enough. I used to say, "I wish I didn't have to sleep so I can get more done." Now that I actually get enough sleep, I get more done. Pretty cool, eh? We also don't appreciate doing nothing enough. We call it being "lazy" and feel guilty when we fill our time with something that doesn't produce results. But it's as important to learning and living as any chore, workbook or activity. Taking regular breaks gives our brains enough time to process our experiences. It's like training for a marathon or some other physical training. We have to give our bodies rest in order to increase our stamina and strength. If we don't take days off to do "nothing", it breaks down our muscles, instead of strengthening them. If I've been training hard for many weeks, and I take a break, when I come back, I can often break a distance barrier I hadn't been able to break before. My muscles have had a time to recover from the challenging training, and to change according to the demands that have been put on it. In the fitness industry, it's called muscle memory. And each sport trains muscles to memorize different things. That's why an elite runner is not automatically an elite swimmer just because he's fit. Our muscles learn from what we practice. An elite runner will tell you that rest is an essential part of training. One day of complete rest a week keeps a runner's muscles from over-training and breaking down. They wouldn't recommend running everyday either. They cross train with other sports and physical activity to give the running muscles a break, and time to recover from training. This is similar to what happens to our brains when we learn. If we don't give kids breaks in their learning, and regularly let them do nothing, they won't be able to fully process the things they've learned. It makes it difficult to go to the next level. People learn in spurts, with nothing in between to give the brain time to process. Sleep is an important way for the body to rest. Our brains use that time to re-live the things we experience during the day, deciding which information is important to keep in the forefront, and which is important to stow away or forget. Although we aren't sleeping, time when we do nothing serves the same purpose. It gives us an opportunity to step away from what we've been doing a little bit, and process information. How and when we need these breaks will be different for every person, at every stage of life and learning. There will be times that we cannot pull ourselves away from a topic until we are completely and totally saturated. When we are filled up with as much information we can possibly stand about that topic, our natural reaction is to focus on something else. While our attention is turned to this new thing, we haven't forgotten what we experienced, we're processing it. Usually unconsciously. Then, when we come back to it, we will be able to approach from a fresh, more mature, perspective. And our brains will be ready for more training. This was one reason we chose not to use a learning schedule for our kids. From the beginning, we could see that how they learned was completely unpredictable. They learned in spurts. Not linearly. And no amount of coaxing from us made them learn any faster. In fact, it almost seemed like our coaxing slowed down their learning, much like running everyday trying to progress faster, actually slows down our muscles' ability to adapt and grow. When we try to make our kids go faster, we can actually be slowing them down. From learning to walk to learning to read, from learning to talk to learning how to add negative numbers, the kids all need time to process on their own, and the freedom to push when they need to as well. That isn't to say, I don't test the waters, and throw things out there to see if they bite. But if suggest something to them, and they would rather do something else, their brains are full. Anything I give them overflows the glass, and makes a mess inside their psyche. Then I have to clean it up later. I'd rather keep the glass about 3/4 full, keep them wanting more, asking for more. Teasing their brains and keeping them on their toes. That way, when they are thirsty, it's easier for them to know, and for me to know, that they are ready to learn. And, when they rest, I can smile, knowing that it's what they need, instead of freaking out that they aren't doing enough. I also notice that if we don't take regular breaks, then when we do finally get a break, we don't know how to use it, or enjoy it. Incorporating lots of relaxing and recovery into our lives has to be habit for it to be useful. And, I don't mean scheduling "rest" from 5-6 everyday. It doesn't work that way. We need to fall in love with rest. And love it just as much as we love the work we do. If we feel guilty when we rest, we never really get the rest we need. If we are in love with it, and appreciate it as much as everything else, then we will be better equipped to recognize the signals that our brains are giving us to take a break. Kids love rest and having fun. They haven't learned to feel guilty about it. Kids don't think of rest as "bad". They learn that from us. From adults. Who tell them that resting is "lazy". And listening to their inner signals telling them when they need to focus on something else is wrong. Kids are born with an inner ability to know when to rest, just like they are born with ability to know when to eat, when to sleep. It's a learned behavior to get out of touch with our body's ability to be full of food, activity or learning. That's not to say that we should just let kids sleep all day, everyday. That kind of extreme behavior might be a sign of serious depression or undiagnosed physical illness such as a thyroid imbalance. If we love rest, we won't let kids do that. It's when we are apathetic that we allow our kids to do whatever they want all the time without comment. If we love the things we do - love rest, love food, love play, love work, love ourselves... then these things aren't a threat to our idea of what kids should be doing with their time. We come to understand what sleep and food and rest are for and how they are good for us. When we can see that these things are good for us, not our enemy, we can embrace it when we need it, and let it go when we don't. Getting breaks and sleep is a vital part to everyone's learning. How much we need, when we need it and how long we can go without it is different for every individual. But we all need time off. And we need them at regular intervals. It's not the enemy. If it were, there would be no such thing as burnout. Let's give ourselves a break and enjoy it! Think of it as never-ending training for the marathon of life. How and why do we impart our knowledge on our children? Now, that’s an important question! I guess it depends on what we want for our children. If we want them to be mini-mes, or to take over the family business, then our whole upbringing will be focused on what we know and how to carry on our legacy. However, if we want our children to make their own life choices, then imparting our knowledge is more of a process of sharing, and allowing our children to be included in our lives to see what we do so they can use that experience in whatever endeavor they choose. Whatever we teach them, or whatever experiences we give them, is a gift to them. We can give the gift with trust that they will appreciate it in their own way, or we can give that gift with attachments. Unconditional teaching is a way of sharing knowledge, with whatever form, without the attachment that our kids should do something specific with what they learn from us. Personal passion is the best way to give the gift of learning without attachments. When we’re passionate about something, we can’t help but impart our knowledge on our kids, because we will talk about it and be open with what we do. And when we’re enthusiastic about something, the kids can easily see that the reason we are sharing our knowledge is because we ourselves find it important, giving them the freedom to decide how to use the information. Although, it is indeed possible to push our passion onto our kids and expect them to follow in our footsteps, if our goal is to give our children as much experience and knowledge as possible without wanting to push them into something, passion is an excellent way to go about it. I think of my hubby, who has a hard time communicating his knowledge in a teacher->student approach. For him, the most effective way for him to educate our children is to work on a collaborative project. As soon as he tries to instruct the kids in his “school teacher” tone, it falls apart. I can hear his voice get frustrated, edgy…expecting. If he lets them help him and works with him on a common goal, hammer in hand, it is like a song in harmony. But how do we know which skills to teach our children? Which ones will they need in their adult life? To be honest, we can’t know. Our parents raising my generation would never have known that computer science was the way to go, or that it would also bittersweet to those who chose to pick that subject, especially if they are one of the many who got caught up in the .com mess. My neighbor is a plumber, and he makes a wonderful living. My other friend is a carpenter/GC, and he struggles to survive. They are both wonderful at their craft. Why does one make a good living, and another doesn’t? How could anyone have known what information these people grew up to be as adults? The tools for making a living when we get older are only partly the practical knowledge of a subject. The “whats” of making a living can be learned at any time, at any age. What’s much harder to learn, if it’s lost as a child, are flexibility, willingness to pursue something previously unknown and to see opportunities where others do not. But in the end, knowing ourselves and just being who we are, are the best tools for being successful as adults. Making a living requires an ability to work with people in some fields, and to be able to work independently in other fields. For some, making a living is determined by inertia and creating opportunity where we fly, for others it is advanced preparation and a plan to make something where nothing was before. In the same way that everyone has a different skill set, everyone also has a different way that making a living will come to them. In this sense, there is no one universal way that teaching our kids stuff, no matter what stuff we teach, will ensure adult success. In other words, our children’s adult success is NOT about what WE give them, but about how we support the things they ALREADY have in them. Teachers and parents cannot create anything new that doesn’t already exist in their beings. We can only work with the child that we have in front of us – not what we want that child to be later. My hubby makes a living working 9-5 for a boss, and he likes it that way. He’s tried working at home, he’s tried being the boss. He prefers being the lead engineer, 9-5ing, not being a boss. For me, that would be soul crushing. I either need to be the boss, or break away and be independent. He and I started out in college working similar jobs (computer tech/help) and we went two different directions. Not because of what we knew. Not because of what we learned in school. Not because of the breadth or depth of our educations, but because of who we were – our personalities and inner beings as individuals. Although electrical engineering is a very successful way of making a living for my husband, there was no way to know ahead of time that’s where he was going to go – or if there was even a possibility he’d go that way. He could have grown up and wanted to be a historical fiction writer or a painter. How could his parents have possibly known or prepared for what he was going to be – or how we was going to get there? They did not prepare him to be an engineer. In fact, he spent most of his time working in his dad’s nursery. By the time he was done with high school, he had chiseled his way into understanding the elementary concepts of engineering despite all of his schooling and family experience. His family allowed him to pursue his passion, and didn’t make a big deal about school. They saw how he worked with computers and electronics – something his schools (and his parents) did not have any capacity to teach him – and let him pursue it. They had no understanding or knowledge of computers or anything technical, yet it was because of their supporting of his skills that he was able to be what he was born to be – not because of what he was taught, or what his parents wanted him to do, or what specific knowledge his parents imparted on him. He became a successful adult because his parents passed down the power of personal truth. I think that in families that are close, where parents are transparent about what they do for a living and for hobbies, children will be naturally more inclined to be interested in what their parents are doing. And even if they don’t follow in their parent’s footsteps, they will have at least a rudimentary knowledge of what it is that their parents actually do, in a practical sense. Homeschoolers have the freedom and flexibility to include their children in any and all endeavors that they deem appropriate for their age and their capabilities. By showing our passion for what we do, it will infect our children to at least wonder why we love our lives so much. Then, as they grow older, they may or may not learn the what’s of our expertise, but they will certainly learn the passion that is behind it. And as they grow, they take more and more initiative to create their own lives around their own passions because that’s what they are truly being taught by their parents who share with them their means of making a living.